Get a powerful cleaner from ingredients in your kitchen. Force of Nature is an electrolyzed cleaner & deodorizer that uses low-level energy to transform ordinary salt, water, and vinegar into a non-toxic cleaner—that’s as effective as bleach. Mix the activator with water, press the button, and watch the science happen. Spray and wipe for clean, odor-free surfaces all around the house. 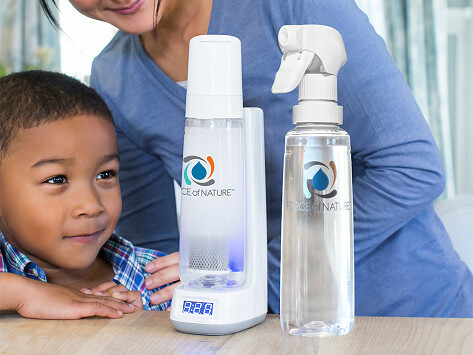 Dimensions: Activator Base: 8.25" x 3.0" x 4.25"; Activator Bottle: 11.0" x 3.5" x 2.75"; Spray Bottle: 11.0" x 3.5" x 2.75"; Travel Bottle: 5.1" x 4.6" x 3.2"; Capsule 5-Pack: 4.5" x 3.0" x 0.4"; Power Cord: 5.1" x 4.6" x 3.2"
Weight: Starter Kit: 2.4 lbs. Very happy with it! Took out an ironed- on stain from an antique white tablecloth I found at a thrift shop...sprayed on and walked away-few minutes later-NO STAIN!! Beautiful! Freshened son's stinky sneakers, windows, full cleaning-all with a SLIGHTLY bleach "clean" smell. Bought as a gift for my best friend...I already have a set, it’s awesome! Can you list the ingredients in your cleaning supplies? 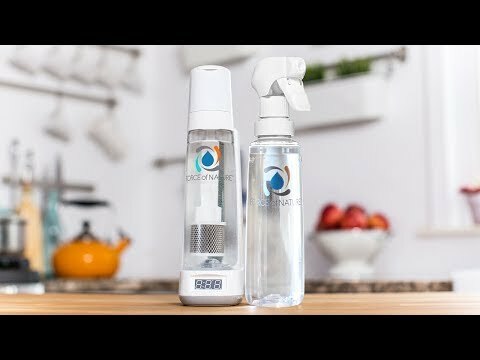 With this system, you can transform simple salt, water, and vinegar into a cleaner and deodorizer as effective as bleach. By processing these household ingredients at low energy levels, Force of Nature creates two powerful—but non-toxic—cleaners. Sodium hydroxide will cut through the grime and grease while hypochlorous acid thoroughly removes odors. Mix the activator capsules with water, then press the button to get this full-fledged cleaning system to work its science. Spray and wipe stovetops, bathrooms, highchairs . . . even dirty sports gear. Maker Sandy Posa was exposed to the super cleaning benefits of electrolyzation after working at a multinational household products company. He wanted a bigger market to benefit from a grease-, grime-, and smell-killing solution that’s free from scents, allergens, and irritants. It’s a safe, all-purpose cleaning system that—once set in motion—saves you money and gives you a clean, odor-proof home.